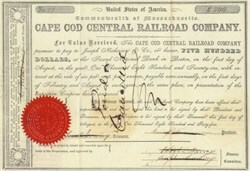 Beautifully engraved certificate from Cape Cod Central Railroad Company issued in 1865. This historic document has an ornate border around it. This item is hand signed the company's president, treasurer, and finance committee and is over 141 years old. In 1861, the Cape Cod Central Railroad was formed to build to Orleans reaching there in 1865. The construction was Delayed due to the Civil War. As Railroad advanced Sailing Packets disappeared and Stage Coaches retreated. In 1868, the Cape Cod Central Railroad was acquired by the by Cape Cod Railroad.